50 years today, on Saturday, August 31st, 1968, Garfield Sobers became the first player in the history of cricket to hit every ball of an over for six. I was lucky enough to have been there. Sobers was captaining Nottinghamshire that day, in a county game against Glamorgan. His feat, which no other batsman had achieved in the 200 years or so cricket had been played, came without warning in Notts’s first innings. It wasn’t part of a frantic run chase, or contrived concession by the other side leading to a declaration. 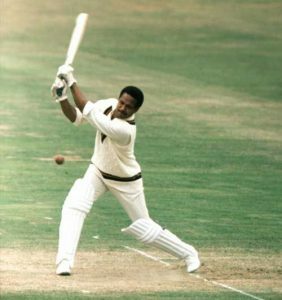 It’s a measure of this achievement by Sobers, generally accepted to have been the greatest all-round cricketer there ever was, that it has only been emulated a few times since, and then mainly in the shortened form of the game, where mighty hitting is expected, and even demanded by the crowd. The full book of that remarkable afternoon, the setting and the events around it is available on Amazon. Swansea – August 31st, 1968. The season was coming to a close. Both sides needed to win that match. Glamorgan were second to Yorkshire in the Championship, Nottinghamshire were fifth. Victory would lift them one place, and win captain Sobers, a cheerful gambler, a bet and a two bottles of champagne. Bunty Ames, wife of cricketer Les Ames, wagered him Notts would not finish in the top six. They would finish fourth if they beat Glamorgan. Nottinghamshire had earlier won the toss and batted. They made fair progress. But at 308 for 5 Sobers needed quick runs so that he could declare and give his bowlers the chance to attack the Glamorgan top order before close of play. Second ball. Almost identical stroke. Sobers struck it high over mid-on, straight to the Cricketers Inn just outside the ground, where Dylan Thomas set one of his short stories. Why did Nash persevere with his slow-left armers? Because he believed he was bowling balls good enough to get out a lesser batsmen, and to tempt even this colossus to miss-time and give a catch in the deep. Fourth ball. There Nash was again, off his six step runup. The delivery was straighter. With the speed of lightning, Sobers pulled the ball over backward square leg and over the mid-wicket boundary into the terrace where we were sitting. It rebounded off the concrete terracing and shot back towards the square-leg umpire. Sobers said later that only then did he contemplate going for the six sixes. Is there a name for the condition in the sports fan where you actually will your opponents to do well, provided he does it gloriously? It does not appear to exist in German, which gave us schadenfreude, a delight in the other’s misfortune. I found something that might come close, the Buddhist concept of mudita. It means “sympathetic or vicarious joy” or “happiness in another’s good fortune”, cited as an example of the opposite of schadenfreude. One definition is “delighting in other people’s well-being rather than begrudging it. [But] the person feeling mudita must not have any interest or direct benefit from the accomplishments of the other.” I think that summed up the feeling of the crowd that distant Saturday. Now it was time for confusion and deliberation. Sobers started walking to the pavilion, thinking he had been caught. Davis’s shrug suggested he did not know if the catch would be allowed. There were no big screens in those days. Besides, the technology of the day could not have coped with replays. Tony Cordle, the fielder nearest to Davis, indicated that it was a six. The two white-coated umpires, Eddie Phillipson and John Langridge, moved together at an unhurried pace, converged and consulted. According to the then experimental change to Law 35, “the fieldsman must have no part of his body grounded outside the playing area in the act of making the catch and afterwards.” Without that change, which seems logical, because the ball still crosses the boundary rope, even if a player is clinging on to it, Sobers would have been out. As Davis had carried the ball over the boundary, Phillipson signalled another six. For the first time the ground erupted. We didn’t want this to end. He writes in his autobiography: ”All sorts of things were going through my mind. If he bowled a no ball or wide, that would make it difficult because it would require a seventh ball. [It would not then be six off six. The achievement would have been diluted.] I felt sure he would try to deceive me, [he] being a former fast bowler I thought he would run up as if to bowl another off-break and then bowl a straight, faster ball. In a microsecond his brain had processed the delivery, and the instant it bounced his bat was describing a glorious arc over his right shoulder. If they ever recreate the over in a movie, the director must not slow this sequence down. The drama is the speed. In a heartbeat, the ball was above our heads and over the boundary, still rising. “Even if I had a top edge it would have have gone for six, but I caught it right in the middle of the bat and not only did it clear the short boundary, but it went over the stand as well, running down the hill towards Swansea town centre.” We will forgive him the geographical exaggeration – and there is no hill. “All the way to Swansea,” echoed Wilf Wooller (more understandable excess) in his television commentary. In another sense, though, the ball went further still. Right around the world. It was the strangest sort of excitement. Not the elation of victory, but the murmured “Did you see that?” after you have witnessed something rare and tremendous. I remember feeling very privileged, that in that instant there was nowhere in the world I would rather have been. All around there was a murmuring of incredulity, then the sort of warm but restrained applause we wouldn’t recognise today. Pictures show about a quarter of the crowd on their feet, the rest clapping where they sat.